Live updates on fuel availability and station outages in states affected by Hurricane Irma. Our gas-availability tracking systems are active. 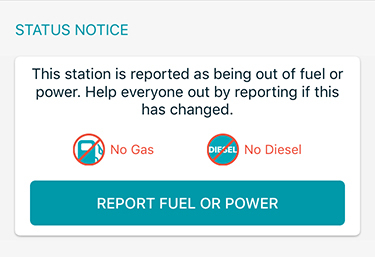 This includes in-app features and an online tracker to provide information notifying users of gas stations with no fuel or power. The percentage of Florida gas stations without fuel continues to drop as recovery efforts continue. Gas stations in Florida are seeing percentages of stations without fuel slowly decrease as recovery efforts continue. Metro area gas stations in Georgia are also continue to see replenishing fuel supplies. All metro areas in Florida are seeing percentages of stations without fuel dramatically decrease as recovery efforts are underway. Metro area gas stations in Georgia are also seeing replenished fuel supplies. All gas stations in Florida cities listed below have seen the percentage of station shortages slowly decrease. Stations in Georgia and South Carolina are also seeing lower percentages of stations without fuel as the day progresses. Florida gas stations in West Palm Beach, Miami, Gainesville, Jacksonville, Naples, Tallahassee and Tampa are beginning to replenish their fuel supplies. Georgia is seeing increases to fuel consumption as Floridians begin to make their way back home, putting a strain on many gas stations to keep the fuel flowing as Irma moves through Georgia and Alabama. Jacksonville sees an 8% increase in station shortages since 2pm and is now reporting 56% of stations are out of gas, while Tallahassee sees a 5% increase in station shortages. We are also seeing increased shortages in Georgia, including Macon and Albany at 12% and 15%, respectively. Gas Stations in Florida, South Carolina and Georgia continue to see fuel supplies deplete as Irma moves from a category 1 hurricane to a tropical storm. Gas stations in Florida, Georgia and South Carolina are still reporting fuel shortages as Irma moves into Georgia. GasBuddy Publishes Live Data Visualizations of Fuel Outages, Wait Times and Price Spreads in Affected Areas of Southeast US and Texas. Percentages of gas stations without fuel in Georgia are slowly increasing as Irma makes its way up the coast of Florida. 70% of gas stations in Gainesville, Florida are now out of gasoline. Aiken, South Carolina is also seeing fuel shortages. Georgia continues to see stations out of fuel after the a state of emergency is declared for all 159 counties. Tampa, Orlando and Jacksonville see increased fuel shortages as Irma begins to make its way up the west coast of Florida. Additional areas of Georgia are starting to see fuel shortages, including Macon and Albany. As Irma makes landfall in Florida, Gainesville sees a sharp increase overnight of stations without fuel, followed by Orlando and Tampa. More stations in Georgia are also running out, with more than 10% of gas stations in Atlanta reporting without fuel. Central Florida cities now seeing more gas stations without fuel. Additional areas of Georgia are seeing increased fuel shortages. Some Florida counties received last minute shipments, other counties slowly losing gas. Gas stations in the Charleston, SC area also received new shipments. More stations in Georgia and South Carolina are running out of fuel as the storm moves towards Florida. Gas stations in many Miami and West Palm Beach continue to run out of gas as refueling efforts are discontinued. Stations in Georgia and South Carolina are also beginning to run out of fuel as people prepare for Irma. GasBuddy has added diesel availability to help consumers affected by hurricane-related fuel outages. 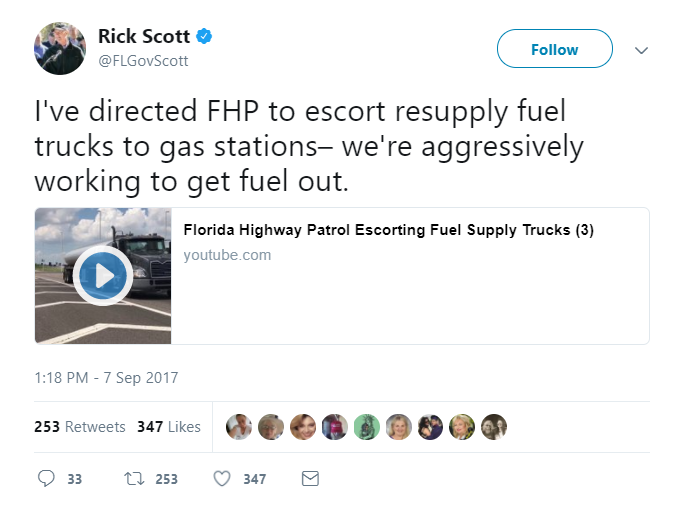 Florida Governor Rick Scott states he is working to get fuel trucks into the state to refuel stations that are out of gasoline. GasBuddy is calling on retail chains in the Southeast to actively update their critical station information and data to aid consumers affected by storm. More info here. Currently 43% of gas stations in Miami, 31% in West Palm Beach, 30% in Tampa without fuel. Florida Governor Rick Scott encourages residents to use GasBuddy to find where gas is available during press briefing.